This is the third installment of a position-by-position preview of the 2019 NFL draft. Part one: Running back. | Part two: Wide receiver. It’s a good year to need a tight end in the NFL draft. From first-round talents to mid-round bargains all the way down to late-round fliers, there is a surplus at the position that’s rarely seen. How good is the talent this year at the position? Not one, but two players – from the same school – could be first-round draft picks. Iowa’s T.J. Hockenson and Noah Fant aren’t the only tight ends who could hear their name called on the first night of the draft, either. There’s a chance that this year’s draft can match 2017, when three tight ends were chosen in the first round. In addition to the Iowa teammates, Alabama’s Irv Smith Jr. is considered a fringe first-round pick. Outside of 2017, taking a tight end early has not been common. In the past 10 years, only one has been taken in the top 10 picks (Detroit selected Eric Ebron 10th overall in 2014). Over that same time span, only the 2017 class featured more than three tight ends being chosen in the top 50 picks. The 2017 class had five tight ends go in the top 50 – a number that could be matched this year. 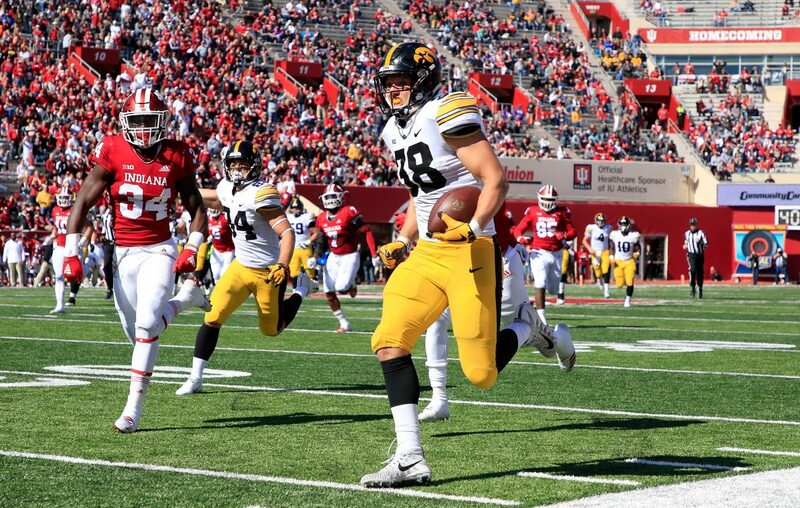 The best: T.J. Hockenson, Iowa. If you’re drafting a tight end in the top 10, he better be the next Rob Gronkowski. It’s not fair to compare Hockenson to Gronk – who may be the best player ever at the position – but Jeremiah said when he watches the Hawkeyes product on tape, he sees a similar “temperament and nastiness” as a blocker. Hockenson is the latest in what has become a pipeline of Iowa tight ends to the NFL over the last 15 years. He won the John Mackey Award as the nation’s top tight end and finished with 49 catches for 760 yards and six touchdowns in 2018. Bills view: Tight end is one of the team’s remaining big needs. After releasing Charles Clay and signing Tyler Kroft in free agency, there is no guaranteed starter on the roster. By signing Kroft, however, the Bills have given themselves options. They don’t have to draft a tight end early – unless they consider it to be a value pick. In Kroft and Jason Croom, the team has two players who look like they’ll be on the 53-man roster. Recently signed Jake Fisher, a converted offensive tackle, also will have a chance to make the team in a blocker-heavy role. What’s missing is a tight end who excels as a receiver first. Quarterback Josh Allen needs as many weapons as the team can find. So who might fit that bill? San Jose State’s Josh Oliver and Texas A&M’s Jace Sternberger are middle-rounds options, while UCLA’s Caleb Wilson might be on the board on the third day of the draft. If the Bills were to spend a first-round pick on a tight end, that player would become the top option and be expected to play in every situation. If they wait until the middle rounds, it’s more likely that player has a specialized role – probably as a receiver more than as a blocker. What’s in a name: San Diego State’s Kahale Warring won’t be able to fit his full name – Kahale Kuio Kalani Michael Wodehouse Warring – on the back of his jersey. Warring, though, is a name that fans should keep an eye on come draft weekend. He played only one season of high school football, but that was enough to attract San Diego State, which offered him a shot to make the team as a walk-on. Warring redshirted in 2015, and a broken foot the following year cut his season short. As a senior in 2018, he finished with 31 catches for 372 yards and three touchdowns, making the All-Mountain West Conference honorable mention list. “He’s somebody that – the best is ahead of him and he’s limitless in terms of athleticism,” Jeremiah said. On the other end: Ole Miss was loaded with offensive weapons in 2018. That meant Dawson Knox didn’t put up huge numbers, but he did flash potential. His 15 catches went for 284 yards – an average of 18.9 yards per catch. That’s elite for a tight end in terms of the ability to stretch the field. Knox converted to tight end after being a high school quarterback. He redshirted in 2015, then played primarily on special teams the following year. Like Warring, he’s a bit of a projection, but there are intriguing physical tools. Sleeper: Donald Parham, Stetson. He’s a massive target (6 feet, 8 inches) who was a consensus FCS All-American and first-team All-Pioneer League pick after finishing with 85 catches for 1,319 yards and 13 touchdowns. His receptions per game (9.4) and yards per game (146.6) led all tight ends playing at the FBS or FCS levels. He’s a late-round prospect. 1. T.J. Hockenson*, Iowa, 6 feet, 5 inches, 251 pounds. The most complete tight end in the draft who a low “bust” potential. 2. Noah Fant*, Iowa, 6 feet, 4 inches, 249 pounds. The more explosive of the Hawkeyes, Fant is intelligent. He wants to become an orthopedic surgeon after his playing days. 3. Irv Smith Jr.*, Alabama, 6 feet, 2 inches, 242 pounds. Smith’s father was a first-round pick at tight end in 1993 by New Orleans. “Junior” may follow in his footsteps. 4. Kahale Warring*, San Diego State, 6 feet, 5 inches, 252 pounds. What kind of athlete is Warring? In high school he played water polo, basketball, cross country, swimming, soccer, tennis and football. 5. Josh Oliver, San Jose State, 6 feet, 5 inches, 249 pounds. Oliver was recruited as a rush end/linebacker, but converted to wide receiver as a freshman after a run of injuries at the position. 6. Dawson Knox*, Ole Miss, 6 feet, 4 inches, 254 pounds. Former high school quarterback played alongside his brother, Luke, a freshman linebacker for the Rebels in 2018. 7. Jace Sternberger*, Texas A&M, 6 feet, 4 inches, 251 pounds. Bounced from Kansas to Northeastern Oklahoma A&M before finding a home with the Aggies. 8. Foster Moreau, LSU, 6 feet, 4 inches, 253 pounds. Started 26 games over the past two seasons for one of the top programs in the country. 9. Drew Sample, Washington, 6 feet, 5 inches, 255 pounds. Struggled through a leg injury as a junior in 2017, but played through the injury to be named the team’s Don James Perseverance Award winner. 10. Isaac Nauta*, Georgia, 6 feet, 3 inches, 244 pounds. The former top tight end prospect in the country coming out of Florida’s IMG Academy.